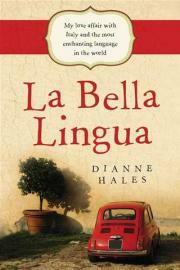 This week I read: La Bella Lingua by Dianne Hales. It’s about the author’s love affair with the Italian language, what she calls, “the most enchanting language in the world.” And it’s a slightly different tale of foreigner falling in love with a European country, because this one features the romantic, as well as the factual. Hales’ knowledge on all things Italian is remarkable – well researched, and well lived. I was drawn to the book because of my own background; being fluent in Italian allowed a certain depth to the book – an understanding, you could say. But La Bella Lingua isn’t just about language; it features a great deal of Italian history too. Dispersed amongst both language and history are personal stories from Hales – most of them joyous and all of them warm and endearing. The entire book is about Italian culture – and how language plays a part in it; in literature, food, film, music, people. And it’s about Hales’ journey – from admirer, to living like a true Italian. Cheaper than a plane ticket, and more informative (and engaging) than a documentary, it’s a celebration of la dolce vita (the sweet life) and le cose italiane (Italian things). ← Billy Connolly and Me. I didn’t know you could speak Italian Sandi! This sounds like a great book.